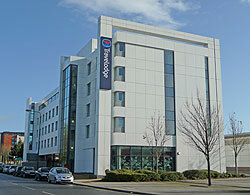 This brand new Travelodge opened for business in December 2008 and is located in the Atlantic Wharf Leisure Park, Cardiff Bay. The hotel's close proximity to the bay means that you are only a few minutes walk away from the major attractions, including; the Wales Millennium Centre, the Welsh Assembly Building, the Norwegian Church, plus the various pubs and restaurants that Cardiff Bay has to offer. Located alongside the Red Dragon Centre in Cardiff Bay. Free car parking for guests.